Another so-called YA (Young Adult) motion picture property has reached its cinematic conclusion. Billed as “the next big thing” 3 1/2 years ago with the release of the first Hunger Games movie, the series has lived up to its hype. The movie adaptation of the final book of Suzanne Collins’ best-selling trilogy, Mockingjay, has been bifurcated and, although there’s little doubt this was a financially savvy move, the creative results are dubious. Mockingjay Part 1, released a year ago, was a disjointed, incomplete affair and, although Mockingjay Part 2 is more polished, the pace is uneven and there’s a sense that the series has hung around too long. In keeping with the tone of the source material, Mockingjay Part 2 is bleak. There’s nothing wrong with this - plenty of the best sci-fi movies have been dark. The problem is that, in addition to removing the light and hope, Mockingjay has robbed the series of its uniqueness. Suddenly, it feels like every other dystopian motion picture - and there are a lot of them out there. It’s impossible to distinguish large stretches of Mockingjay Part 2, with characters running around in subterranean tunnels being chased by zombie-like creatures, from similar segments of The Maze Runner movies or the Divergent series. They all blend together and that’s not a good thing for any of them. The earlier Hunger Games movies stood apart. No longer. And Katniss (Jennifer Lawrence), reduced to an automaton as a result of PTSD, has become generic. Mockingjay Part 2 unsurprisingly begins where Part 1 ended. Katniss is recovering after nearly being choked to death by her former lover, the traumatized and brain-washed Peeta (Josh Hutcherson). Distressed about what has happened to Peeta, Katniss volunteers to be part of an assault on the Capitol. Her goal is to confront and assassinate President Snow (Donald Sutherland). The President of the Resistance, Alma Coin (Julianne Moore), is in favor of using Katniss for maximum political value, even if that means turning her into a martyr. 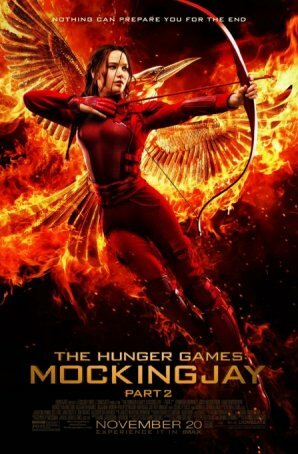 Joined by allies like Gale (Liam Hemsworth), Finnick (Sam Claflin), and Boggs (Mahershala Ali), Katniss makes a push for the Capitol but soon learns that her primary role may be as a decoy and media star. Despite some engaging battle scenes, Mockingjay Part 2 at times becomes repetitive. The attack on the Capitol is overlong, featuring a protracted sequence in tunnels and underground corridors. All this leads to an anticlimactic ending that, although it makes a strong political point about the moral ambiguity of war, is not cinematically satisfying. The “twist” at the end is neither surprising nor unexpected. Even those who haven’t read the book will see it coming. Another disappointment is the characterization of President Snow. The sneering, Machiavellian dictator who sought Katniss’s death throughout the first three films has been reduced to a feeble shadow of his former self. In Mockingjay Part 2, he’s almost to be pitied. His schemes are ineffective and his inevitable downfall is dramatically inert. Snow, who was unquestionably a villain “we loved to hate” in The Hunger Games and Catching Fire has devolved into a pathetic bad guy - someone it’s difficult to summon much feeling about one way or the other. If one of the expected pleasures of seeing Mockingjay Part 2 was to relish Snow’s inevitable downfall, the way in which the narrative unfolds cheats viewers of that. When one considers the amount of talent packed into the cast of Mockingjay Part 2, it should come as no surprise that the acting level is high. Oscar winners and nominees abound. Jennifer Lawrence is not as compelling or charismatic as she was in the first two Hunger Games installments, but that’s a result of how the character is written - Katniss has been transformed into a shell-shocked, revenge-driven Terminator. Josh Hutcherson does his best Manchurian Candidate impression but the chemistry he shared with Lawrence is missing. The Katniss-Peeta-Gale love triangle collapses into irrelevance. Many returnees from the previous installments (like Woody Harrelson, Phillip Seymour Hoffman in his final role, Stanley Tucci, and Julianne Moore) are accorded little screen time and no opportunity for development. Director Francis Lawrence, who did a good job with the action scenes in Catching Fire (he helmed all of the Hunger Games films except the first one), is unable to replicate his success here. There are a few suspenseful sequences - a notable one involving an oil-trap and one that evidences an Aliens influence - but many of the movie’s so-called “high octane” sequences are visually impressive but emotionally shallow. Several key deaths have little or no impact. At least it can be said that Mockingjay Part 2 ends the saga. All the individual storylines are wrapped up and there’s a nice little epilogue. There’s no doubting that this movie has high aspirations - it wants to depict war not as a rah-rah, video game experience but as something violent, desperate, and destructive. But the compromises it makes to attract a wide audience neuter the message. Mockingjay Part 2 never goes “all in” and, as a result, it fails to satisfy as either a traditional sci-fi adventure blockbuster or an exploration of the dark side of war. The Hunger Games movies began with much promise but after the pinnacle of Catching Fire, it has been a slog to the finish line. We’re finally there and I feel more exhausted than fulfilled.